For more information about ORTHOLOC 3Di Small Bone Plating System, please visit http://nederlands.wright.com/footandankleproducts/ortholoc-3di-small-bone-plating-system. 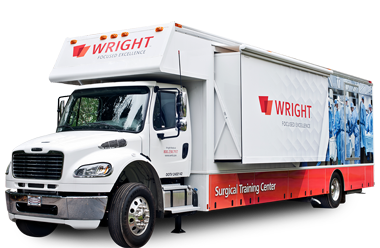 More information on Wright Medical’s products can be found at nederlands.wright.com. For more information about SYNCHFIX, visit: http://nederlands.wright.com/footandankleproducts/gravity-synchfix-syndesmosis-fixation-device. The INFINITY™ Total Ankle System is intended to give a patient limited mobility by reducing pain, restoring alignment and replacing the flexion and extension movement in the ankle joint. Individuele resultaten en de mate van activiteit na een operatie variëren en zijn afhankelijk van vele factoren, zoals leeftijd, gewicht en eerdere mate van activiteit. Een operatie brengt risico's met zich mee en er is een herstelperiode. Voor sommige mensen wordt een operatie afgeraden. 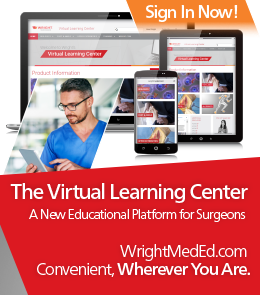 More information on Wright Medical’s products can be found at nederlands.wright.com. The SALVATION™ External Fixation System is designed to address fractures, nonunions, and complex foot and ankle deformities including Charcot neuroarthropathy. The system relies on proven techniques utilizing tensioned thin wires, half-pins and rings. The SALVATION External Fixation System incorporates many new features to assist with proper frame positioning and increase frame application efficiency. Dankzij het sleufringontwerp kunnen framecomponenten snel en gemakkelijk worden bevestigd, terwijl er minder kleine schroefdraadcomponenten aan elkaar hoeven te worden bevestigd. The system includes components to assist in the positioning of the foot and lower leg within the frame and maintaining appropriate position throughout the surgery. Voorts maakt de draadgeleider nauwkeurige plaatsing van de draad op de ring mogelijk, zodat er zo min mogelijk extra verbindingscomponenten nodig zijn en het aantal extra handelingen tijdens de ingreep wordt beperkt. The SALVATION External Fixation System may be used for definitive treatment as the sole fixation device, or used in conjunction with the SALVATION Beams and Bolts or the SALVATION 3Di Midfoot Plating System. For more information about SALVATION, visit: http://nederlands.wright.com/healthcare-professionals/salvation/salvation-external-fixation-system.